I often wonder what long-time subscribers of Landscape Management think of current issues of the magazine. The article reported there’s been a 30 percent to 40 percent increase in grass seed prices over the past four years, and the turfseed industry devalued by $200 million after the recession. Was such a dramatic change in turfseed supply and prices even fathomable to subscribers 26 years ago? Oh how times have changes. 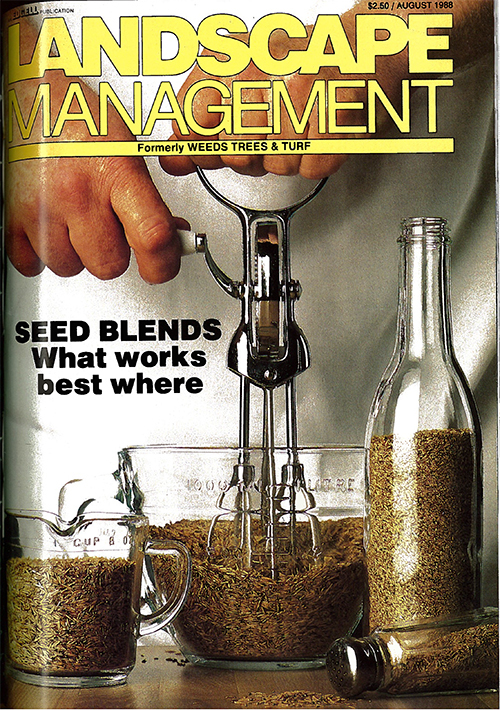 Gander at the cover story from the August 1988 issue of LM and you’ll quickly get a sense of the how good the good times really were for the seed industry. In 1988, tall fescue was coined “the ‘new darling’ of the turf industry,” said Tom Voigt, assistant horticulturist at University of Illinois—Urbana. Due to its average cultural intensity level, deep roots and germination rate, Voigt said a mix of 90 percent tall fescue and 10 percent Kentucky bluegrass offers a more tolerant, thicker turf that can fare well in the cold months. A similar relationship is seen between Kentucky bluegrass and perennial ryegrass, Meyer said. The strong recover rate of Kentucky bluegrass enhances—or makes up for—ryegrass’s slow recovery rate, while ryegrass lends its wear tolerance to Kentucky bluegrass. Returning to present time and the January 2014 issue of LM, Bruce Jump, turfseed production manager at WinField Solutions, said with those aforementioned varieties now in short supply, it’s more important than ever to keep your mind open to using new ones or varieties you may have overlooked in the past. His advice: Tell distributors what you’re looking for out of your grass, not the type of grass you want. “The earlier you can have those conversations, then we can get your seed locked in,” he said.